Running to Stand Still: A Rushed Thursday Nite Run ! Thursday was a busy day! My Thursday's, have me traveling roughly around 175- 200 miles this day, seeing some of my accounts over in Pa.
Every other Thursday is food shopping for the family, which I do right after work. On top of that, I needed to run 6 miles, and go to see a buddy of mine in Burlington, to get a Thule rack he was selling, for our van. Ya can never have enough space for traveling, when you pack 4 people & 2 dogs up for a vacation. See, Saturday we actually get away for a week+ vacation downashore! I got out the door to do my run at about 6:00pm. Again, like Wednesday, I didn't know where to run. The wife was asking me where I was running. It's always good to have someone know where you are running... just in case. I wasn't sure, but told her what I was thinking of doing. Well, I strayed a little off of that course. I need to find different routes, to keep this training on track. 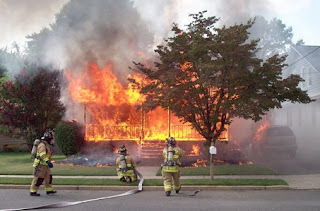 I decided on a route that would take me past a bad house fire that happened Monday afternoon. Luckily no one was hurt in the fire, but the house is a total loss. This was about a mile from where we live. The legs where feeling it after a week of long runs. The thighs had that "I need a day off feeling". It was nice to get the run done, and get that sense of accomplishment, that I am another day/ run closer to Nov.23rd. This Saturday will be a nice easy 4 miler, before we leave, and Sunday is another 1st.. 16 miles! I have planned on a run from Wildwood to Cape May. I will be bringing along my camera, to take some pics for the peeps. The route I take, hopefully will produce some nice wildlife or roadkill for every one's enjoyment! One nice thing I have noticed, is that I am starting to get to a place in my runs, where I knock off the miles at a steady pace. Enjoy the weekend! Go Phils !! Good luck with the 16. My plan calls for 17 Sunday, although I will be leaving the camera at home this time (currently on the market for a camera small enough to fit in my race ready shorts, if such a thing exists). Wildwood to Cape May sounds cool, I am anxious to read about it. Go Eagles, oops, I mean Phils! Yikes on that house fire. Your training is really coming along and progress shows in the numbers. Great job and good luck with the sixteener. Ahem, lets go Mets! Nice splits and have a great vacation! Sad about the house fire. Glad no one was hurt. It is so unfortunate about the house fire. It is a blessing that no one got hurt. You are doing hell of a terrific job with your running. Nice splits. I look forward to your photographic-report run tomorrow on your blog. It should be a beautiful run.